I started the day with some gardening, before the sun was high enough to singe my bonce! I cut the azulina and bougainvillea hedge, it has grown fast, at the weekend I will have to cut the other one on the roadside. That done it was time for something a bit petty, but it made me feel better. The Brujas (Witches) that live behind and below us, have been a constant thorn in the side, they make out that they don't understand me, just to wind me up, but they understand quick enough, when they want something, I have now cottoned on to that, and refuse to lend anything. A little over four years ago, I approached head Bruja, and asked if they could re-align their security light, it came on when people or their dogs used the garden gate, and was purposely set high so that they would not be blinded, however that meant it was shining directly into our bedroom, and I was being woken at all hours...she refused! As a result, I had to go to the expense of buying black-out blinds, and then make a wooden track for the blind to sit in, to stop lights coming out of the sides, I blogged about this at the time. I talked about making pelmets, but light creeping above the blind was not a problem, until recently! 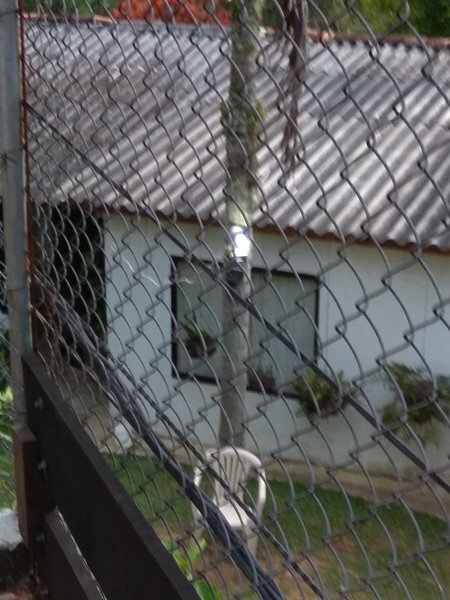 Their sensor light broke, or at least I presume it did, and now they just have a cable from the house to a normal indoor light attached to their palm tree, which is switched. The wattage must be the highest they could buy, and it is left on all night every night, at first I thought it was done by accident, so I called out to the head Bruja one morning, and pointed that out, after making out she didn't understand, eventually she thanked me, and said they had forgotten, but no change, it turns off in the day, and on again all night. At 3am every morning I am woken by the light in the bedroom, and jump out of bed thinking it is daylight, and time to take the dogs out, only to realise it's the damned light. So this morning, it was time for some retribution, and I had a rather large floodlight stored away in the workshop that fits the bill nicely. 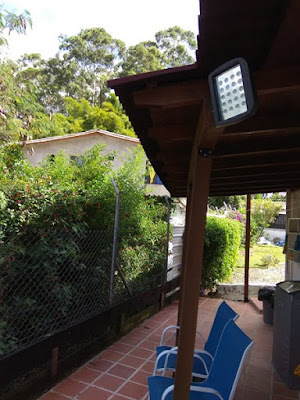 I wired it up to the wiring in my garden tool shed, replacing the single switch with a double, that window behind the palm tree is where the mentally deranged Bruja (her daughter) sleeps with hubby, and is now in the line of fire. In fact it is really an addition to our security, anyone could come over the fence at the side of the house, and I want to ensure our dogs see any intruder before they have a chance to enter the house, it will be turned on when we go up to bed, and off when I come down in the morning, being LEDs, it will not cost too much to run, and at the same time the Brujas, may get the message. After that was done, I got cleaned up and went down to Copacabana, Marcela spoke with the Planning Dept, with regard to Enimigo, and I lodged a letter with their Boss, stating that any attempt to circumvent the law, will be countered with legal action. Marcela came away feeling a bit more re-assured that they will ensure that at least our privacy is protected, as for me, I have learned that no one here can be trusted, so for me the 'Proof of the Pudding is in the Eating'. 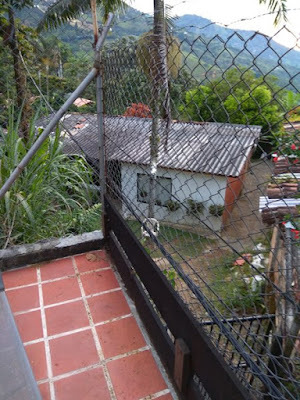 We then had lunch, after which, Marcela headed for Bello and work, and I returned home.